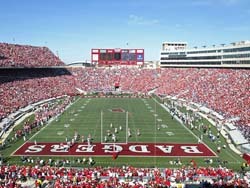 Students who weren&apos;t able to score season tickets for UW-Madison football this fall will have to wait another year. Tickets went on sale Monday morning, and were gone in just three hours. Associate Athletic Director Vince Sweeney says they usually go pretty fast, even at $133 for seven homes games. Last year, the UW tried a lottery system for tickets, but students didn&apos;t like that method. They went back to a first come, first served basis this time around.